Written for teens, Believe: Student Edition is part of the national church-wide campaign led by bestselling author Randy Frazee that takes teens on a journey to become more like Jesus in their beliefs, actions, and character. From bestselling author and pastor Randy Frazee comes an exciting new all-church discipleship program inspired by the success of The Story. Introducing students and teens to the big ideas of Christian life and theology in a way that is clear and accessible, Believe: Student Edition helps them understand how to live out God’s story in their own lives. As they walk through the three big categories of faith—beliefs, practices, and virtues—they’ll begin a journey that will take them closer to the heart of Jesus and deeper into the words of Scripture. 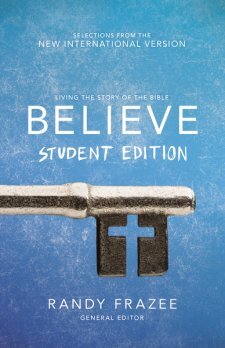 Relevant, practical, and deeply fundamental, Believe: Student Edition is a must-read for any student serious about their faith. Randy Frazee is the senior minister of Oak Hills Church in San Antonio, Texas, where he teaches and leads in partnership with pastor and author Max Lucado. Prior to Oak Hills, Randy served as teaching pastor at Willow Creek and as senior pastor at Pantego Bible Church in Fort Worth, Texas, for fifteen years. He is also the author of Making Room for Life and The Christian Life Profile Assessment Tool. Frazee and his wife, Rozanne, have four children and one granddaughter. Believe Student Edition is an excellent resource for all students to learn to be more like Jesus. Believe Student Edition explores 10 beliefs, 10 practices, and 10 virtues of the Christian Walk, divided into three sections which are Think, Act and Be. I love that Believe Student Edition teaches us to not only think about what it is we believe, but how to implement it into our everyday lives. Learning to be like Jesus is something we all need practice with on a daily basis. This is a great resource and a wonderful addition to any students library! You can find Believe Student Edition on Amazon, Barnes and Noble and other bookstores.